Fairfield by Marriott Manchester-Boston Regional Airport offers newly renovated clean, designer rooms that have a warm modern feel. The hotel features a hot and healthy breakfast buffet each morning which includes items such as scrambled eggs, cheese omelets, waffles, pork sausage, veggie patties, fresh cut fruit and more. The Fairfield Inn by Marriott is easily accessible to routes I-293, I-93 and Route 101. This location is less than 1 hour from Boston, New Hampshire Beaches, Skiing, Mountains and the New England Dragway. 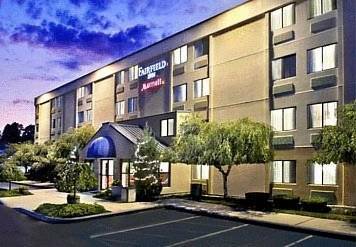 Fairfield Inn by Marriott Manchester-Boston Regional Airport Hotel is in the heart of NH's tax-free shopping. The Mall of New Hampshire is within walking distance as well as other major retailers and restaurants. Other nearby leisure activities include The Currier Art Museum, NH Fisher Cats games as well as the Merrimack Premium Outlet Shopping. Hotel is also an easy commute to SNHU Arena and downtown Manchester Conventions. Guest parking is complimentary during your stay.